Cross was released to critical acclaim. On Metacritic, which assigns a weighted average score out of 100 to reviews and ratings from mainstream critics, the album received a metascore of 81 based on 25 reviews, which indicates "universal acclaim". Rob Sheffield of Rolling Stone stated that "with loads of melodrama and not a moment of subtlety, Justice define the new-jacques swing." 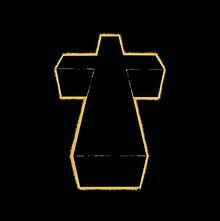 Jess Harvell of Pitchfork called the album a "harsh and mostly instrumental set that nonetheless plays like the ideal crossover electronic-pop record", noting that "Justice knows how to sequence a dance album to avoid drag and boredom." Michaelangelo Matos of The A.V. Club described it as "an engaging study in contrasts and a killer party record." In his consumer guide for MSN Music, critic Robert Christgau gave the album an honorable mention ( ) rating, indicating a "likable effort consumers attuned to its overriding aesthetic or individual vision may well enjoy". Christgau stated: "As dance music, not my idea of a good time, but as electronic pop, so much trickier, sillier and more kinetic than Kraftwerk."